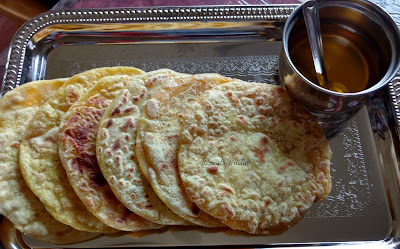 Ubbati or Puran poLi is one of the dishes that I never thought I would ever make. My mom makes amazing ubbatis. Every year during the annual car festival my mom would make a big batch of sweets and savories to distribute among her office colleagues and our neighbors. She would make the dough and filling in the morning and afternoon after lunch we would make start the process of stuffing and rolling. Usually my aunts would come over to help and after I grew up I would help her with the roasting part.This recipe is my grandmother's who used to make yummy ubbatis. Unfortunately I never got to taste them! I never attempted to make them as my mom would always make a big batch of it for me. During my usual India call amma mentioned that she made some ubbati and A asked if she could send some here. He loves it a lot so I decided to give it a try. It looked difficult but amma gave me step by step instructions and since I have seen her do it before I knew the process but only lacked confidence to try. I am glad that I tried it as it came out really well and got over in no time. If I can make it anyone can! 1) Mix all purpose flour with turmeric powder if using. Add 1/4 cup water and make a sticky dough. I used saffron mixed in water and added at this stage. Knead. Add 1/4 cup oil and keep kneading until all the oil is incorporated in the dough. It looks like a lot of oil intially but as you knead it gets absorbed. The key to soft ubbati is the kneading!! It might take around 15- 20 mins and If the dough is still sticky add some more oil and keep mixing until you get a soft and pliable dough. Once done cover with moist cloth and keep it for a minimum of 3-4 hours. 2) Pressure cook the washed chana dal with water for 4 whistles. Drain the water. Reserve the water to make some yummy saaru. To the drained chana dal add sugar. The heat causes the sugar to melt. Mix and let it cool. Grind it to a smooth paste and pour it in a kadai or wok. Cook this on low flame until it comes together into a mass with no water content in it. Let it cool. Make balls of the size of big lemon. 3) Knead the outer dough again and make small balls out of it. The sweet balls should be twice that of the outer balls size. Dust it lightly with flour and roll it into small puri. You can also use the palm to flatten it into puri. Keep the sweet ball at the center and gently cover it with outer dough without tearing it. Seal it by pressing the ends. Dust it with more flour and roll it gently into a medium sized uniform thickness chapathi. 4) Heat a tawa hot and bring it to medium and fry the rolled ubbati without using ghee or oil. Take care not to flip the ubbati too many times in between. When you see some spots on the surface turn it over. If you flip it too many times there are chances of the delicate ubbati tearing. Keep cleaning the burnt flour on the tawa at regular intervals. 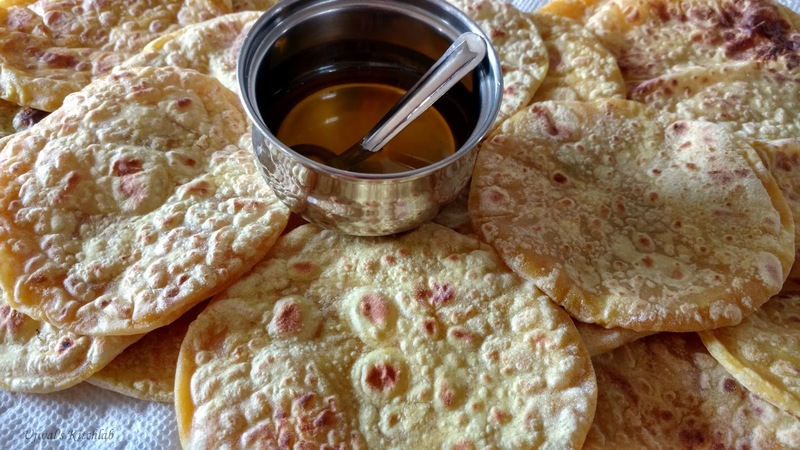 Else they stick on to the ubbati and gives slightly bitter taste with black specks of burnt flour. 5) When done place it on a big flat tray lined with kitchen towel to absorb the moisture from the ubbati. Maintain distance between the ubbatis. Only after the first layer has cooled down you can place the next over it. When it is completely cooled line a container with clean kitchen towel and stack it. You can warm the ubbati slightly in microwave and serve with home made ghee! 1) Make sure to make the outer dough well in advance as it needs resting time. Plan accordingly. This helps in making them soft. 2) You can also grind few mustard seeds and mix it with maida and then knead it to make the outer dough. This also makes the ubbati super soft. 3) After cooking the sweet mixture make sure that its completely cools completely before making balls. 4)Do not flip the ubbati often and make sure to keep cleaning the tawa at regular interval with clean cloth. 5) Cool the prepared ubbati completely before stacking them. These remain fresh for 4-5 days if stored properly. To increase the shelf life you can refrigerate and warm it on tawa or microwave before eating. Fresh home made ghee and milk are perfect accompanients to this yummy delicacy.